Ohhhh!!!! It is BEAUTIFUL!!!!!! Love it Max! Ho anche io foto di questo tipo, è un posto incantevole da visitare!!! Now that is truly bizarre. The stillness adds to the eerie feeling. Although under the lake lies a village submerged, all over the place there is a great sense of tranquility. Such a very moving, ‘still’ image, Max. It gives me shivers to think of the village, including the rest of the church, lying at the bottom of the lake. Just a bit… the place is very peaceble, noiseless. 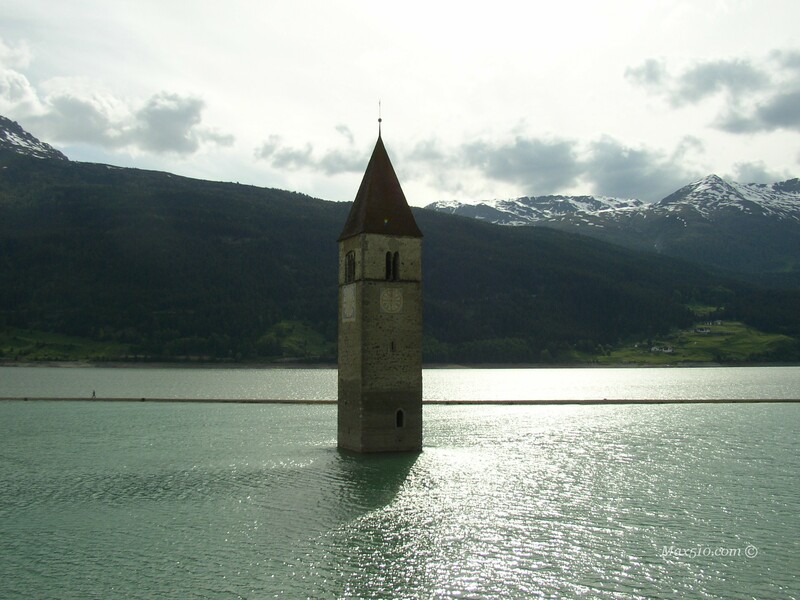 Che spettacolo il campanile che spunta dall’acqua! Ma a cosa e’ dovuto il fenomeno max? Hanno creato una diga ed un lago artificiale in una conca dove giaceva il paese di Curon Venosta. Spopolato il paese, hanno riempito… e spicca il campanile della chiesa.